The government today said that it is laying the groundwork for a new constitution, including a new electoral system based on what is popularly known in Sri Lanka as the German Model. 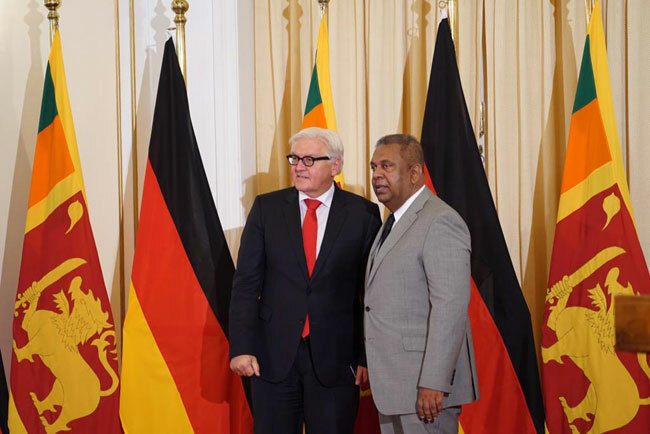 Sri Lanka’s foreign minister Mangala Samaraweera was speaking at a joint press briefing after holding official talks with Germany’s Federal Minister of Foreign Affairs, Dr. Frank-Walter Steinmeier in Colombo. He stated that the Federal Republic of Germany is a very important partner for Sri Lanka and their relationship has stood the test of time. Based on our shared values, we have discussed steps being taken by the Government of President Maithripala Sirisena and Prime Minister Ranil Wickremesinghe to promote reconciliation and to strengthen the accountability processes as part of our Government’s overall objective of ensuring good governance, respect for human rights and strengthening our domestic initiatives, he said. “There are several areas in which Germany has agreed to assist us in building local capacity and sharing experiences,” Samaraweera said. I have just concluded a meeting with the Federal Minister of Foreign Affairs of Germany, His Excellency Dr. Frank-Walter Steinmeier. This is Minister Steinmeier’s first visit to Sri Lanka and we are indeed honoured and happy to welcome this distinguished minister to our country. I also hope that this visit will allow me to reciprocate the warm and cordial hospitality extended to me when I visited Berlin a few months ago in May. This morning we continued the dialogue that began then, with that visit. We have also agreed to vigorously build on our multifaceted bilateral relationship. Our fruitful and productive discussions focused on identified areas of cooperation and on working towards forging closer and tangible links in the short and long term. A bilateral official visit to Sri Lanka by a German Foreign Minister takes place after 11 years. Your visit is a reflection of the close relations and goodwill that exists between our countries. Minister Steinmeier, you have come to Sri Lanka at an exciting time in our history. The Presidential Election in January and the 19th amendment to the constitution that followed soon after restored democracy and paved the way for good governance. This mandate for reform and reconciliation was re-affirmed in recently held general elections. Sri Lanka is now consolidating its democracy and transitioning towards a rules-based polity and economy: we are laying the groundwork for a new constitution, including a new electoral system based on what is popularly known in Sri Lanka as the German Model, resolving long-standing grievances of minority communities and embarking on wide-ranging economic reforms to create a social market economy with a genuinely level playing field. The Federal Republic of Germany is a very important partner for Sri Lanka and our relationship has stood the test of time. Based on our shared values, we have discussed steps being taken by the Government of President Maithripala Sirisena and Prime Minister Ranil Wickremesinghe to promote reconciliation and to strengthen the accountability processes as part of our Government’s overall objective of ensuring good governance, respect for human rights and strengthening our domestic initiatives. There are several areas in which Germany has agreed to assist us in building local capacity and sharing experiences. I would particularly like to highlight their contribution towards vocational training and skills development: the German Technical Training Institute in Kilinochchi which the Minister hopes to visit this afternoon will be a tremendous boon to the youth of the North and Eastern Provinces. The German Technical Training Institute in Katubedda established nearly 3 decades ago has similarly hugely benefited young people of the South. We have agreed on prioritizing closer economic cooperation. Germany is Sri Lanka’s fifth largest export market, accounting for nearly five percent of our exports. Last year our total exports were US$ 824 million and our target is for trade turnover to cross the US$ 1 billion mark within the next few years. Now that Volkswagen is and other German companies are taking an interest in Sri Lanka, we would also like to encourage other German firms, including those from the Mittelstand, to take advantage of Sri Lanka’s skilled labourforce, improving governance and ready access to emerging markets along the Indian Ocean rim, including India and Pakistan with whom Sri Lanka has free trade agreements. We look forward to regular high level interactions at all levels which will certainly pave the way for a more robust German - Sri Lanka relationship which will benefit our countries and our peoples. Later today Minister Steinmeier will call on President Sirisena and have discussions with Prime Minister Ranil Wickremesinghe. I believe these discussions will provide an opportunity for both sides to understand our priorities and to find ways of taking our close and friendly relations to greater heights. I wish Minister Steinmeier and his delegation a pleasant stay in Sri Lanka.